2070 nautical miles of blue ocean from San Francisco to Hawaii. We're on our final 200 miles to the finish and thing are starting to become bittersweet as the end is near. We've been working pretty hard to maintain a 200+ miles/day made good pace and have done well. So has everyone else. It's a fairly tight finish considering the four top boats in our division are within six hours of one another, not a very large margin considering the length of the race and size of the course. If you're following along online, there are two different things you can track. Overall time to finish (bigger boats generally go faster so they finish earlier) and corrected time to finish (takes into account handicaps which allows different boats to compete against one another). When we talk about time to finish with regards to just Recidivist we mean the former. When we talk about time to finish with regards to the fleet, it means the latter. Yesterday night was really dark with significant cloud cover along the horizons and a late rising moon. Although winds were good, surf angles were not making it difficult to stay on course and sail safely while surfing for speed. But it was an enjoyable night as we sailed through plankton fields leaving glowing 'stars' in our wake. Accompanied by the genius of Freddy Mercury it evoked the imagery of old hand-drawn movie posters of spaceship sailboats riding a wake of stars. Today was an improvement with generally good winds and decent surf angles as compared to yesterday night. We kept a strong pace throughout the day and remained on port pole from dawn to dusk. The evening was gorgeous and the ocean kept us going strong with very ideal conditions. All of us hope the trend will continue to carry us to a strong finish and some well deserved mai tais. Somewhere between San Francisco and the 1500+ miles we've already sailed this race became less about a race than about being out here. But now, as we are in the final days to the finish we are making every effort to finish strong. The crew is tired but we have a good groove going and will continue to focus on the race. Winds are generally good and will hopefully continue right up to our finish. 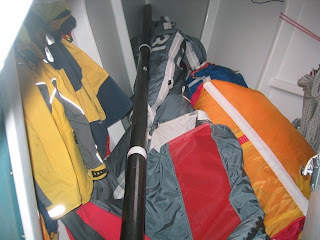 1) We came within 100 ft of a single-handed Transpac racer smack in the middle of the night. It is extremely rare to come this close to another boat and we even had to harden up to clear his transom. A few words of VHF were exchanged and on we were, wishing each other a speedy race to the finish. 2) Night sailing has been highlighted by a bright moon glowing yellowish white from the sunlight with a visible milky way in clear patches. 3) We've spotted Japanese finishing buoys on the horizon in the last two nights. 4) Larry fell ill for a day and the remaining crew members went to a "two-on-two-off" watch schedule for a day. But he's all better now so fret not. Day 6 started off like day 5 ended... wonderfully open and bright blue skies mated to deep indigo blue water shimmering with sunlight and interspersed white cap ridges. The horizon stretched out in a continuous even line around the vessel. It's hard to describe how blue, how bright, how deep, how pure the colors can be when neither environment or observer are tainted by worldly troubles. By mid-morning the sun shone brightly on Recidivist's deck as she made her way through the rolling waves in comfortable 15-20 knot winds. The watch crew splashed the occasional bucket of water onto the deck to cool it while the off-watch crew relaxed in the cover of the cabin. A few minor squalls came by and showered us with cool fresh water. Some of the crew lathered up with shampoo right before the squalls hit to get a 'proper' fresh-water shower. Shortly after lunch we spotted a lone white bird circling our vessel. Sensing an opportunity we decided to put some lures in the water and troll for fish. Sean mentioned that in all his years of sailing he'd never caught a fish by trolling off a sailboat. But just 15 minutes later, Roscoe hauled in a 10lb Mahi Mahi that proved to be the highlight for what was already a spectacularly enjoyable day on the water. We filleted the fish on the transom and cut up a few delectable pieces of 'as-fresh-as-it-gets' sashimi, which we enjoyed with a bit of light soy sauce and wasabi on the back of the boat while passing around a few cups of red wine to go along. A few other pieces were steamed with lemon, lime, soy, and wasabi for an incredibly tasty snack. It was the first fresh food we'd had since we left San Francisco and skipper Ken exclaimed that it might've been the best mahi he had ever had. The entire crew was delighted at our good fortune. The sun has set against a pastel colored horizon with a dramatic golden bronze glow that is reminiscent of a certain brand of sunscreen lotion. As the sun set, we spotted Venus, who has been at our constant hip since the first night we cleared the marine layer. About five miles north north west of our us are sporadic white lights dancing along the horizon, each which seem to be a few miles apart. They are possibly the same field of buoys reported by coms vessel Valis earlier today. We do not know what they are but guess they are deployed by NOAA or some other organization for scientific purposes. It's a warm night with some intermittent rain. Recidivist Out. Day 5 is upon us, and this afternoon we have just hit the halfway mark. We are now the farthest point from land in the world, and to celebrate we cracked open a bottle of wine. We have a peach cobbler on the stove and crew morale couldn't be higher. Last night we took a few hours off of the two boats in front of us in our division, Morpheus and Hula Girl, and we're still in the hunt. About mid-afternoon today, we were entertained by trying to "floss" a doormat off of our keel. 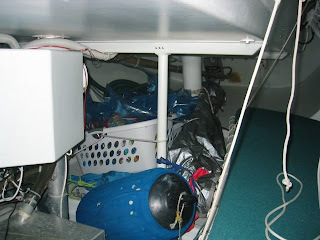 We could feel a slight vibration in the rudder, checked the underwater scope and sure enough what we thought to be a plastic bag was a doormat. After a few failed attempts to use a line to drag the mat off of our keel, we had to briefly take down our sails and back off of it, a total of 140 seconds lost. We also had someone go up to the top of the mast to do a mid-race check on all of our halyards and the small tear in our main. Everything looks to be in order and the small hole shouldn't affect our boatspeed. Day 4. The crew awoke with thoughts of mutiny. Our vessel was boarded by two squid overnight. We deterred one with a paper towel and left the other lying on our transom as an example to all would-be conquerors. Light winds through the night had left us exposed and no one was particularly happy about the prospect of another day wallowing lifelessly in the sea under an overcast sky. Skipper Ken, sensing trouble, decided to break out a secret weapon to raise the spirits of the crew. Corned Beef Hash. Like dogs to chow we munched and the rebellion was temporarily repressed. Navigator Larry opened the first jar of mandarin oranges. These prized morsels we plundered from the food storage barge before the crossing are reserved for special occasions. Since today is his birthday, it was fitting for him to do so. Everyone knew the calm would be short-lived as the crew sat around hoping for something to do. So we decided to play liar's dice in order to elect a new captain. The logic being that the best liar amongst us would be best-fit to lead our motley crew. Ken won. Twice. The organizational fate of the crew determined we labored on, one mile at a time. Until, at last, a break in the grey sky exposed a radiant bulb that bathed us in glorious sunlight. For four days we had not seen her... and there she was, as glorious as ever. The entire crew assembled on deck as winds picked up and we sailed (and on occasion surfed) our way into a golden sunset drenched with wine and Sriracha colored hues. We just finished our dinner after a day of re-organizing the boat. Come to think of it. It was the first meal we had all together since the first day. Today's menu included 'Backpackers Pantry' du Jour with your choice of Pad Thai and Cajun Chicken and rice. All selections were accompanied by Sriracha with a hard boiled egg starter and optional orange for desert. A fresh pot of coffee will keep us through the night. Tomorrow's menu is a surprise for everyone except Ken who will be preparing the meal in celebration of Larry's birthday. As a gift from the boat he receives a 1AM watch shift ;). If you're reading this blog, please feel free to leave a birthday wish for Larry in the comment section. We turned our ship clock back an hour to adjust for our westward progress and the ever later setting sun. Larry will have to get up earlier and earlier for check-in, since the race will stay on PDT. This evening continues to be overcast with zero percent chance of showers and winds between 10-15 knots continuing today's rather mundane weather pattern into tomorrow. After two days of cold, drenched, tired, hungry, sea-sick misery we've finally launched the kite and turned the wind to our backs. The boat is no longer dripping wet, heeled, and rollicking uncontrollably with waves crashing over our bow every few seconds. She's flattened out and the crew, after struggling to maintain morale, has picked up considerably. It's a brand new day. Finally, a bit of calm after building axiousness all week. I laid in bed awake after just four hours of sleep. It could've been 12 hours for all I cared. Time to go. There are basically four stages to the race. We will start inside the bay right outside St. Francis Y.C. The starting line runs between two buoys in the water and every one must cross the line in the same direction to start. Most race starts are upwind starts (meaning you'll sail into the wind). Before the start, boats will sail back and forth behind the starting line setting themselves up for the starting sequence. The starting sequence is a series of audible signals (horn or gun shot) and visual signals (raised and lowered flags) and all the boats will jockey for position on the start such that they 1) cross the line at the precise moment of the start 2) are going full speed and 3) are positioned to benefit from the wind and race conditions more than any of other boats. Since this is a very long race the start will be less aggressive than usual leaving less chance for collisions or anything else that can jeopardize the trip. The last part of the race is a more or less westerly to Hawaii . Once the boats hit the tradewinds, it's a straight shot to Hawaii with the shortest distance often being the only strategy. There’s a great article by Stan Honey on the Pacific Cup website that covers this and more. … the toilet. There’s no magic here, it’s a puka through the hull, requires manual pumping (read: flushing) and can plug. 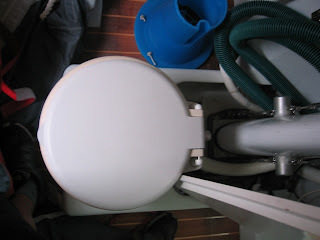 To minimize any incidents Ken has a strict rule on the boat: if it doesn’t come out of you it’s not going in the toilet. This means you collect your tissue paper, walk it out and toss it over to bio-degrade. Luckily we have hand sanitizer and wetnaps. 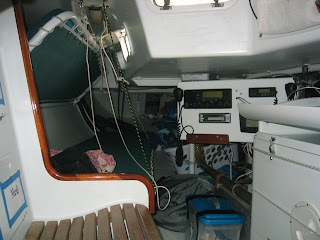 The main area houses two settees, pipe-berths above each settee, the sink, cooler, stove, and companionway. 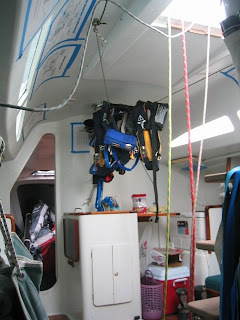 The blue things you see hanging from the ceiling are lifevests and tethers. One of the settees is used to store gear. Above is a shot of our kitchen cabinet/pantry. 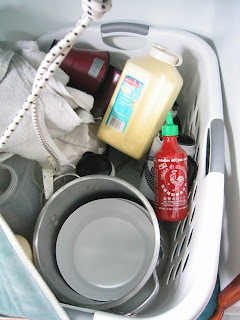 All we have is a couple of plastic bowls, mugs, utensils, aluminum foil, a pot, Gatorade mix (to help with the water), soy sauce (in case we catch any fish), coffee, coffee creamer, and two bottles of Sriracha. Yeah, that’s right, Sriracha. Apparently, every single one of Ken’s dryfreeze meals is flavor Sriracha. The kitchen consists of three propane burners. We use two a day to heat water for coffee and dry freeze food. The jig you see here tilts so it remains upright. This is critical because it allows you to cook while the boat is heeled over. On either side of the companion way are seats with cubbies in the seat backs. 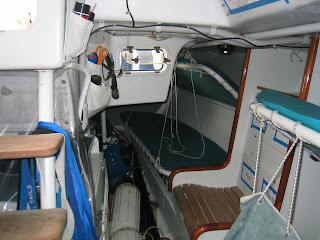 The starboard side is the navigator chair as the laptop and instruments are set up on that side. 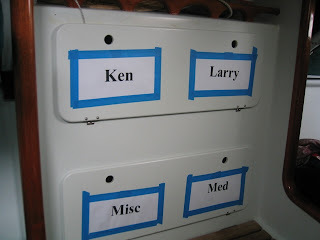 Cubbies on the starboard side are designed for Larry, Ken, medical items, and miscellaneous. 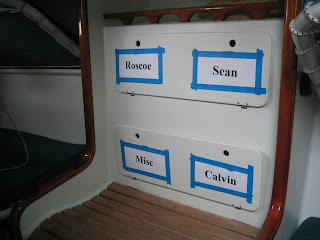 The port side has been dubbed ‘the librarian’s chair and its’ cubbies are designed for Sean, Roscoe, Calvin, and another miscellaneous. Something interesting about Recidivist is that she can be configured to have the navigator chair on the port or starboard side. The reason why we have it set up for the starboard side is that the Pacific Cup race is heavily favored towards starboard tack. Placing the navigator seat on the starboard side allows us to stack the navigator’s weight and instruments onto the windward side of the boat. Doing this enhances the boats performance. 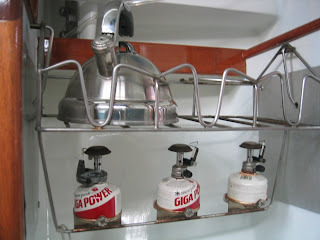 While the boat is heeled, we’ll be sleeping mostly on the starboard side, hot bunking with the relieving man on watch. Once we reach the trade winds and the wind moves aft the boat will flatten out and we’ll start using the port berths as well. This initial stage can last as long as 2/3rds of the race but will hopefully not last more than a third of the race. 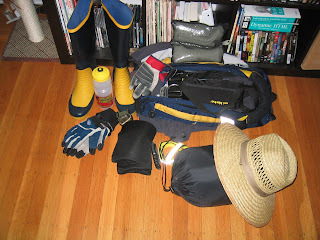 The above picture also shows a water bottle, some velcro ties, a sun hat (for the latter half of the race), and an ultralight sleeping bag. 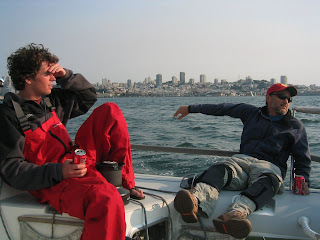 Yesterday we took the boat from its temporary home in Redwood City back to Alameda, going out the gate for a little while and stopping by the skippers meeting at SFYC on the way. The most important part of the skippers meeting were the satellite transponders, which are mandatory for all boats and will allow friends and family to track our progress. I've provided a link to the left to the FISTracking website. You'll find our boat in Division E.
In past years FISTracking has had some problems and some of the transponders "crapped out" a few days into the race, creating a somewhat ominous looking map where boats just stayed put a few hundred miles out of gate and leaving friends and family wondering what had happened to the racers. FIST has assured us that they've worked out the kinks this year but you never know. 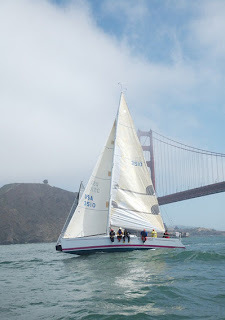 If you find that the boat has stopped on the map you can always consult the pacific cup website for a second opinion. The likely scenario will be that the transponder has gone kaputt and the Recidivist crew will likely not even know about it. Our start is 5 days away and the only thing I'm doing is making final clothing preparations (more on that later), getting plenty of rest, and thinking about the race, non-stop. Visiting my parents helps calm things a bit as it allows me to get away from the hustle in San Francisco. The first boats are starting Monday. Among them, our friends, Stephane and JP on Le Flying Fish. Today I can only imagine how anxious they must be feeling. On Wednesday night, I'll find out for myself. It's July 4th weekend and we have two weeks to go before launch. Things are looking good but there are plenty of last minute preparations that still need to happen. Hopefully we will have everything ready to go by the July 12th skippers meeting. Personally, I am about as excited as I can be. It's gonna be one hell of an adventure.